We started the day in Salina liking the setup down near Dodge City, so that was the initial target. 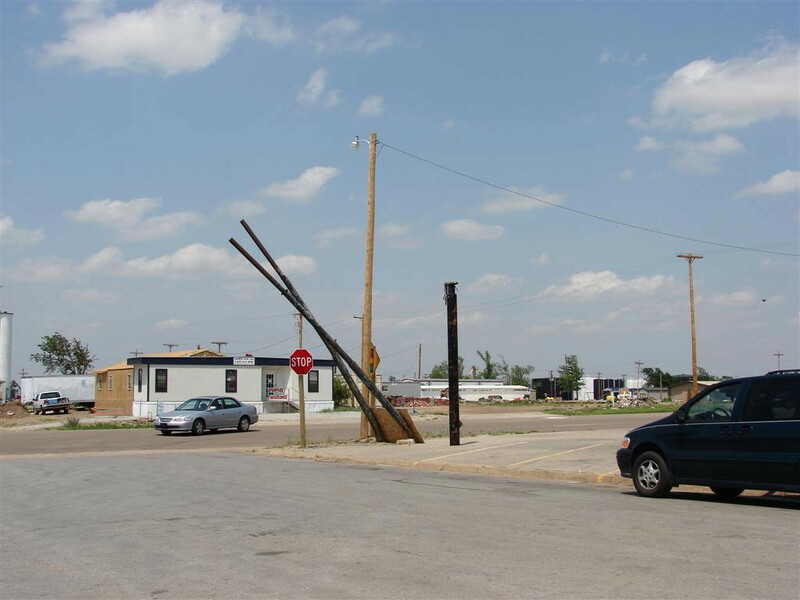 As we headed that way, it became pretty clear that Dodge was at or even behind the developing dry line, so we elected to stop at Larned for lunch and to reassess the target. Some analysis indicated that we shouldn't continue farther west, so we dropped down to Kinsler and then Greensburg. 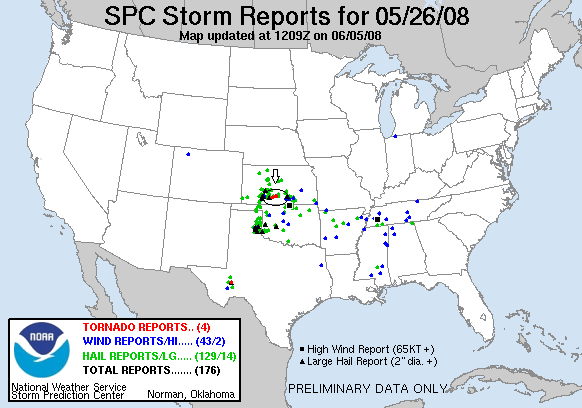 A year after being practically being erased from the map by an EF5, it's still very sobering. Lots of obvious destruction still, with closed roads, bare trees, wrecked buildings, and temporary housing everywhere. There was also massive chaser convergence there. I was kind of happy when we decided to head south as storms started to explode all around us. We ended up running up and down the Rt. 183 south of Greensburg, finally targeting a beefy updraft just south of town. We pulled over to observe under a severe lightning threat and watched as a wall cloud developed very low to the ground and twisted up, passing just to our north but not producing a tornado. As it went by another cell had blown up just to the south of it and we were suddenly in a serious hail threat and had to run for it. We charged north and then west with the idea of letting the core come by and picking up the storm from the south. The storm was getting stronger with a well defined hook though, so we elected to push into the core a little at a time until we got into big hail so as to close ground as fast as possible. This took us back through Greensburg as we headed east. Well, so much for a little of the core at a time though! Once we got into the area where there was hail, we were totally committed to a core punch, with mesocyclone markers on radar to our southwest so there was no turning back! We took quite a whuppin' as we smashed through the core for about 20 minutes. No visibility and hail occasionally up to tennis ball / base ball sized were the main features. To make matters worse, the storm surged east so it seemed like it took forever to get out of it. We actually passed through two towns along the way, and talking to some of the guests afterwards they had no idea, that is how bad visibility was! Once we finally broke out we assessed the damage, lots of fresh hail dents, and the rear van now had a nice one-foot diameter spiral break across the front windshield, luckily not on the driver's side! As we got into the town itself, there was another tornado report just east of town, reporting a touchdown 1/4 mile south of the road, 4 miles out of town. I figured that given the report being a couple of minutes ago, and the tornado only a 1/4 mile south of the road, it must have passed over it by now. We proceeded on in punching the hook from the west. As we got into the hook, the wind was blowing strongly from the north, consistent with what I would expect being on the southwestern side of the hook. Suddenly, we were in a VERY recent damage path! Multiple trees down, one of those long irrigation devices you see in the fields all the time flipped over at the edge of the road, and I'm told there was also an overturned car as well. Off to the left, there was a dark lowering but it was impossible to tell if it was still on the ground (I don't think it was). Then the winds suddenly shifted to the north and I knew we'd passed the main rotation. We probably missed the tornado by at most a couple of minutes. If we hadn't stopped to ponder our move prior to driving through Pratt, it might have been a very close call. We stuck with the storm a bit longer, but it was clear the show was over and the MCS that was developing now covered most of Kansas. We had an extremely wet drive back to the hotel in Salina. Mileage for the day: 418. 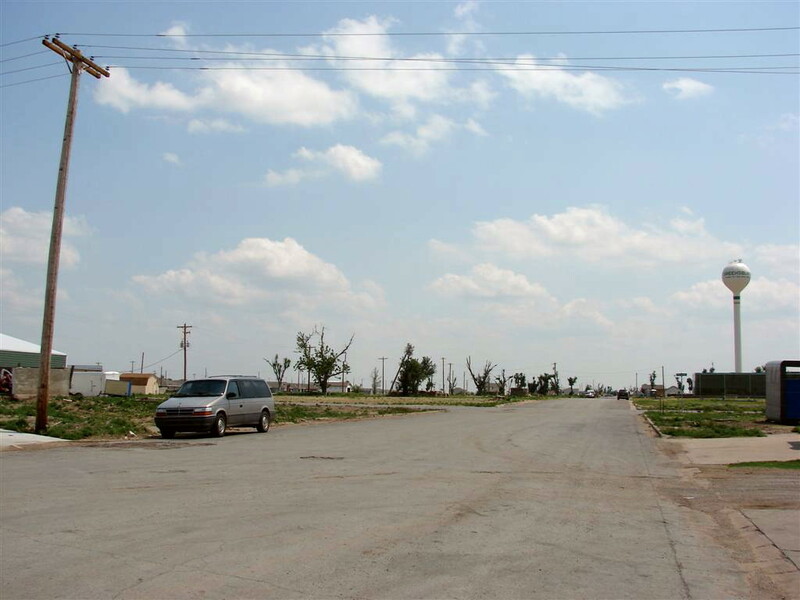 Greensburg, KS a year later. The widespread destruction was still plainly evident. Looking towards what used to be downtown. 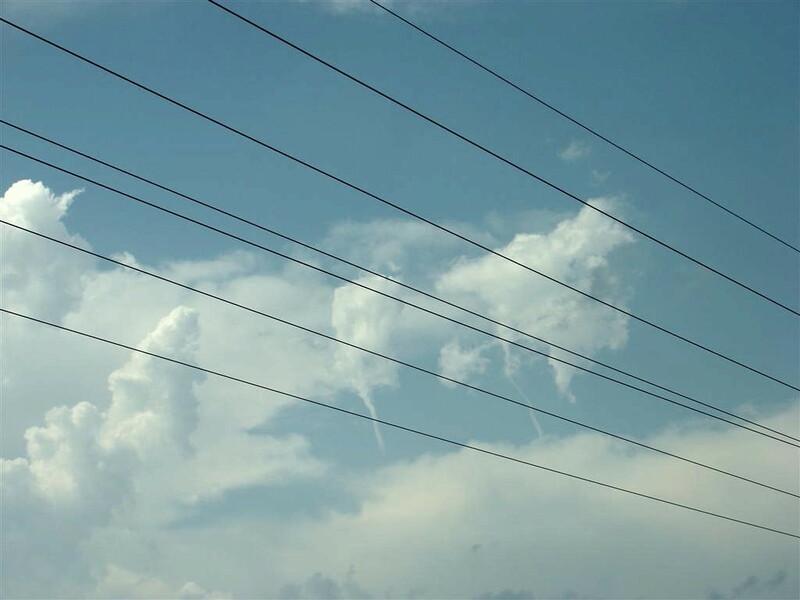 Heading south out of town on Route 183, we observe a couple of mid-level pencil funnels. Pulled over, possibly in the vacant lot of one of the houses destroyed by the Greensburg tornado, a wall cloud with a big tail cloud passes just to our north. Once the storm was almost by we decided to edge into the big hail core a bit at a time until we ran into big hail, in order to get around and into position as quickly as possible. Wrong!!! We get into the big hail just as the radar shows strong rotation to our southwest. We are committed to plowing through the golf ball and bigger sized hail. Note the hailstones skipping across the road in front of my van. 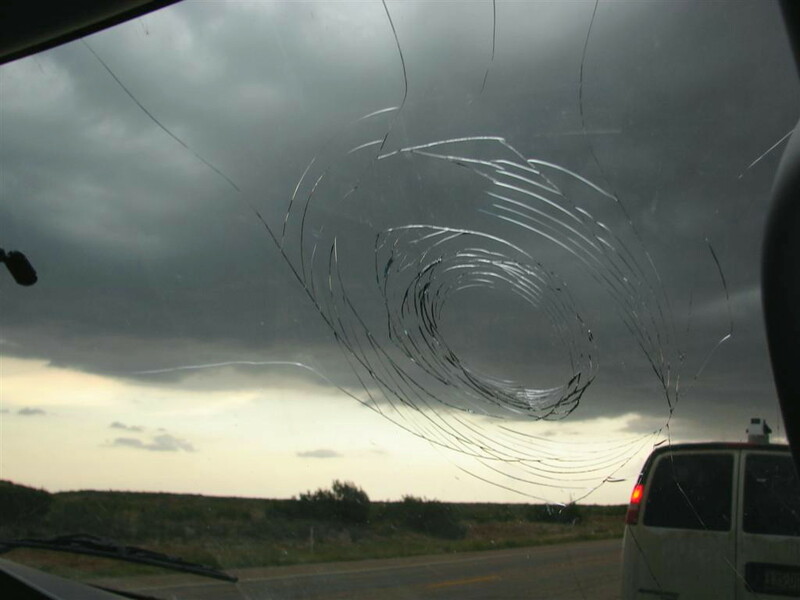 This is what a tennis ball sized hail stone will do to a windshield, as happened to van #3.